Perhaps the greatest mystery in life for the male gender is shopping for females. Combine that with an adolescent’s natural absence of cognitive thinking and you’re guaranteed a doozie of a present. And so it was for Gladys one year for her birthday (actually, it turns out this may have been a Christmas gift, but we’ll talk about today since today is Gladys’ day). It seems Bruce got the idea the three boys should go down to Knapp’s Department Store and pick out a gift. For those of you unfamiliar with the store, Knapp’s was synonymous with great quality and, of course, expense. Apparently Gladys wasn’t too happy with the gift, especially when she learned the boys charged it to her credit card. “I may have been 14 at the time,” says Bruce. That means Duane was 16 and Jerry was 11. Anyway, Gladys obviously was a tolerant woman. And as Bruce said in last week’s post, she put up with a whole lot raising her boys. You may remember a post back in February, when the three guys described their household as the place to gather for all their friends. Gladys would come home from work to broken decor such as her couch and chandelier. Duane relayed a similar story. Even at the end of a weary day, when the comforts of an inviting bed should have awaited her, Gladys didn’t always find rest. That Gladys—she sure was quite a woman, wasn’t she? And how wonderful that her three boys grew up to become loving, doting sons who took great care of their mother. Back in February when I wrote of the difficulties Roland and Glady had, it felt a bit like a betrayal. 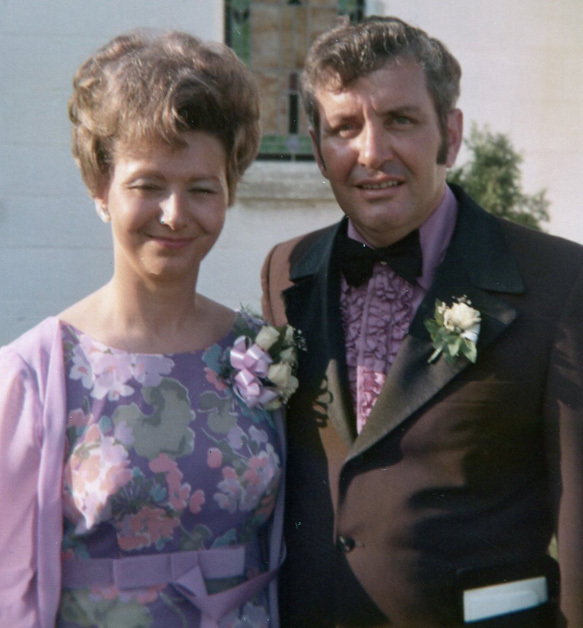 As their grandchild, I think I can vouch for the rest of my generation when I say that both Roland and Gladys were super people (in fact, we even share Super Grandma stories…but more on those in the months to come). So now is my time for restitution. Because this upcoming week is Gladys’ birthday—she would have been 101—she is our person of the week. There’s a lot of great stuff to talk about because, after all, she was Super Grandma. Gladys was born on April 27, 1911, to Earl and Maggie (Laing) Gulick. 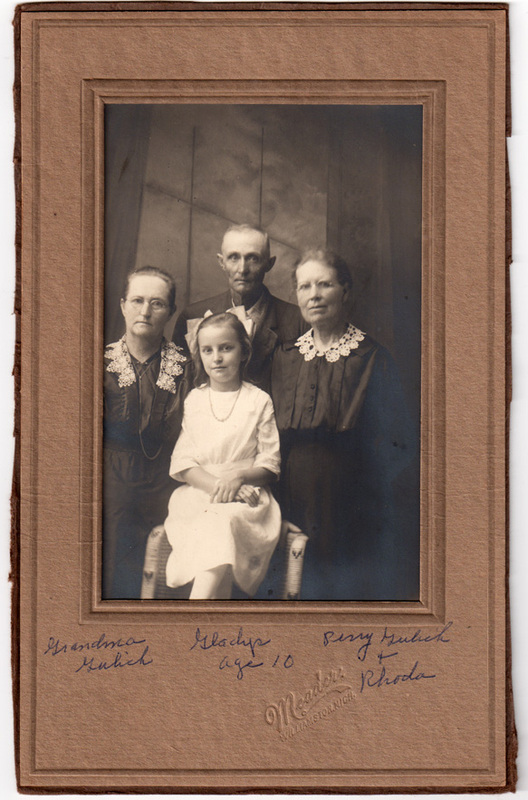 She and her older brother Ralph grew up living right next door to her grandparents Perry and Fidelia Gulick, and just a farm or two away from any number of extended Gulick relatives. This family togetherness was part of Gladys’ growing up. Her first cousin, once removed, was Golda Gulick McBride and, being just a year apart in age, the two were always close friends. Much of what we know of Gladys’ childhood comes from stories Golda shared with Jerry many years later. Childhood wasn’t always easy for Gladys. Her parents had marital problems and for many years, from when she was 5-11 years old, she and Ralph lived next door with their grandparents. By that time, Grandpa Perry had suffered a stroke and wasn’t in his right mind. As the story goes, once Ralph was working in the field and when he took a break under a tree, he looked up to find Perry standing over him with an ax. Perry also was said to have gotten up during nights and done strange things such as setting the table for a houseful of company. According to Golda, Gladys was afraid of Perry. Her bed was at the top of the stairs and she slept close to the edge in case she had to get out fast. Eventually Gladys’ parents divorced. Earl remarried a woman named Clara (White) Swanson, who came as a package with four daughters (one of whom would later marry Ralph). Life was transitional for Gladys during her young adult years as well. For a while she lived with her mother Maggie, who had moved to Lansing and remarried to Jim (JR) Adams. Then, for a while she lived with her brother in a house next door to Maggie and Jim. 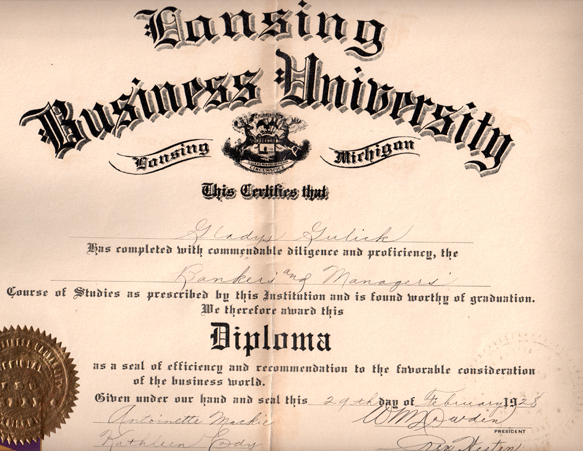 She quit high school after 10th grade and began business classes at Lansing Business University. I ask Duane and Bruce if they had heard many stories of their mother’s younger days. They both say no, Gladys didn’t talk much about it. “She had her hands full just trying to keep Duane in line,” banters Bruce. We all get a good laugh from that. But really, there’s a lot of truth in that statement. In 1929, Gladys married Roland and within a few years was the mother to three young boys. On top of that, her husband was often gone from home and she worked whatever job she could during the difficult times of the Depression. So, yes, Gladys had her hands full. 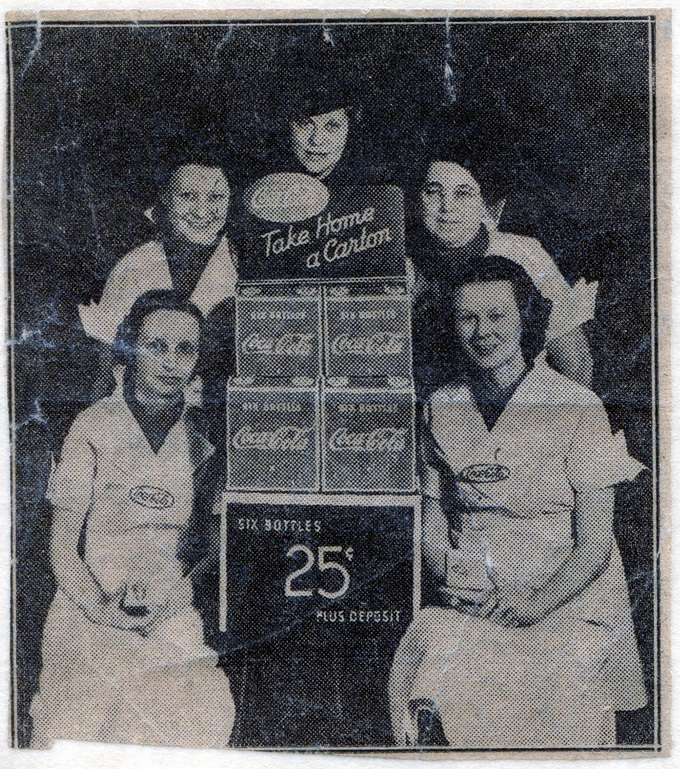 Over the years Gladys worked many jobs, including a job as a Coca Cola girl installing bottle openers in people’s homes. Most of her jobs, however, were office positions. When she worked as a bookkeeper for Liberty Highway, the manager provided her with a pickup truck because she had no other way of getting to work. “The fellow that managed that truck company was very nice to her and always willing to help her any way he could,” says Bruce. I’m thinking she must have been a valued employee, if the company was willing to provide her transportation. 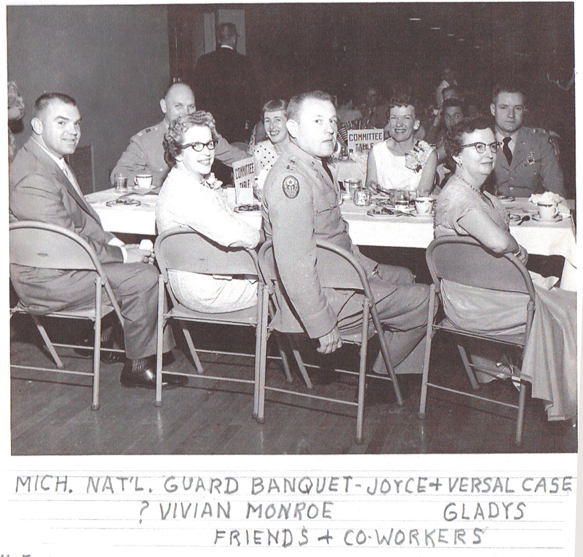 Eventually, Gladys got a job with the Michigan National Guard and worked there until she retired in 1966. “When she got with the National Guard, that was the best paying job she’d ever had up to that point,” says Bruce. In 1949, Gladys had been divorced for a couple years when she met a man named Emil Messerschmidt. He ran a meat packing plant. Emil and Gladys married and she moved her then-teenage boys into his big house. They weren’t married long however. “I went down to Indiana before they got married. Then I went in the Navy. So I didn’t really know him or what went on there,” says Duane. “He kind of liked to run everything,” says Bruce. I ask if that independence was her personality? A trait acquired out of necessity? Or, maybe both? Did the Amos Boys get their strong work ethic from their mother? “I would think so, yes,” says Bruce. In 1965, Gladys married again. 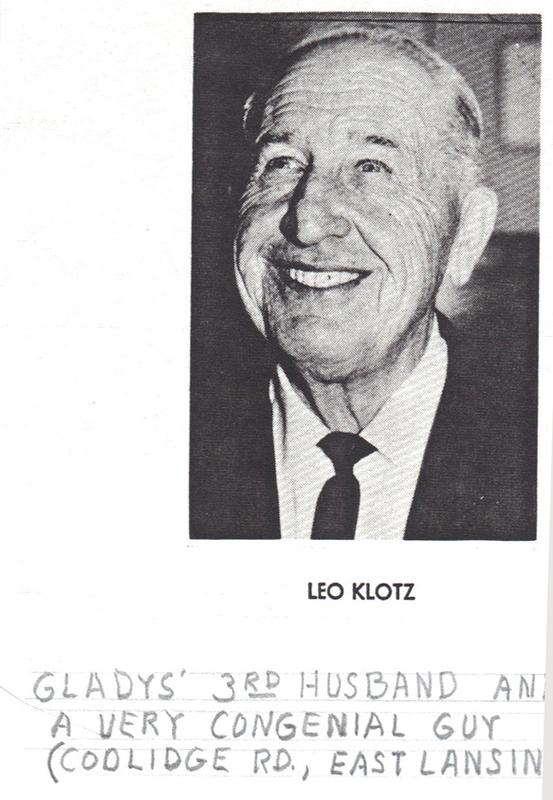 She married Leo Klotz and when it comes to nice guys, she hit the jackpot. Leo had been a security guard during his working days and was active in the Moose Lodge, as was Gladys. Together they enjoyed a busy social life with lots of friends. Sadly, they were only married three years when Leo died of a massive heart attack. As we look at Gladys, we see a woman who took the good things in life along with the sometimes-not-so-good. From there, she went ahead the best she knew how. And she loved her boys. Somehow, as I’ve acquired family mementos, I was given this note. 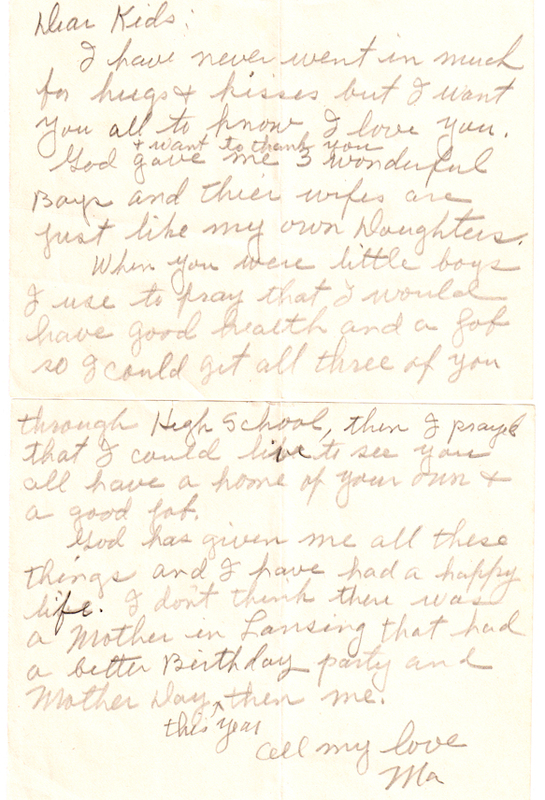 It’s a thank-you written by Gladys to her boys and it’s really special. I think these few words say more of who she was as a person than anything we can write. In 1987, Gladys noticed she was having trouble managing the treasurer’s position she held at the Cedar Place Retirement Community where she lived. Medical tests revealed she had an aggressive brain tumor and not long to live. She moved in with Jerry and Elaine, and on March 27, 1988, she peacefully passed away. She was one month from her 77th birthday. Happy birthday to Super Grandma! What special memories do you have to share? So, one activity we’re planning for the reunion is a drive-by tour of places important to our family history. Topping that off in order of interest is easily the town of Laingsburg. 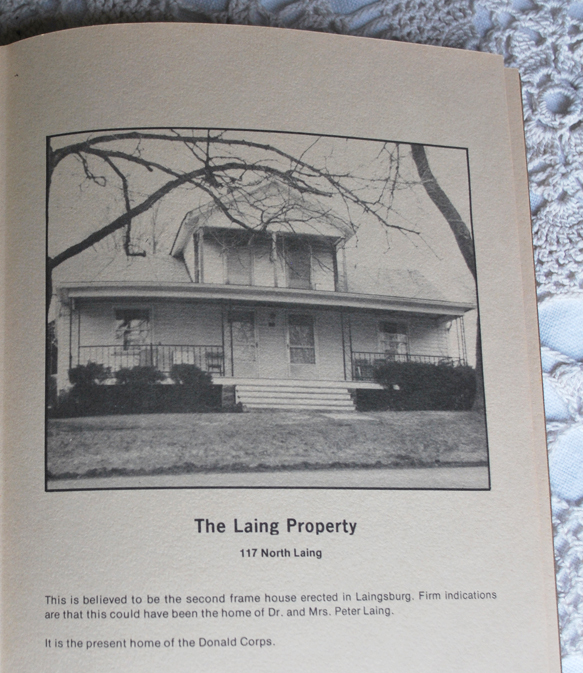 Laingsburg, as you remember, was founded by our ancestor Peter Laing (the Doctor Peter Laing). We know a lot about him from the book The Hill and Below, by Birdie Colby and Emma Jane Wright. 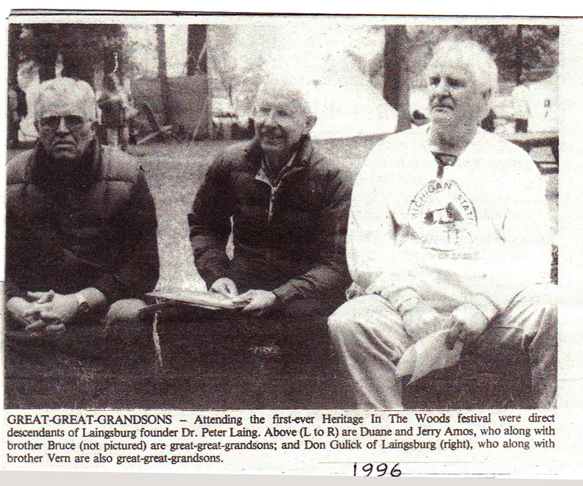 It’s a historical tribute to the town of Laingsburg and delves into the generational details of Peter and his family. In 1833, Peter, his wife Mary, and seven of their nine children came from Wilton, NY, to Michigan. They settled in Ann Arbor where Peter set up a medical practice. In 1835, however, his wife Mary died. Colby, Birdie, and Emma Jane Wright. The Hill and Below. Exponent Press. 1976. pg. 21. Colby, Birdie, and Emma Jane Wright. The Hill and Below. Exponent Press. 1976. pg. 13. 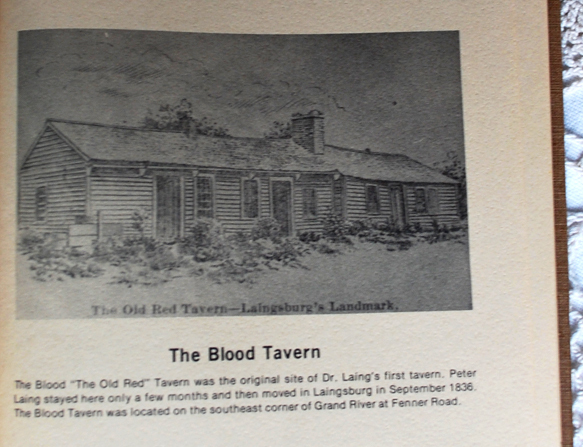 That same year Peter built a home and second tavern near what is now Crum and Church Streets in Laingsburg. In 1837 he established a post office in the tavern and became the first postmaster. Thus the town’s name—Laingsburg. Colby, Birdie, and Emma Jane Wright. The Hill and Below. Exponent Press. 1976. pg. 8-9. In 1844, Peter remarried. 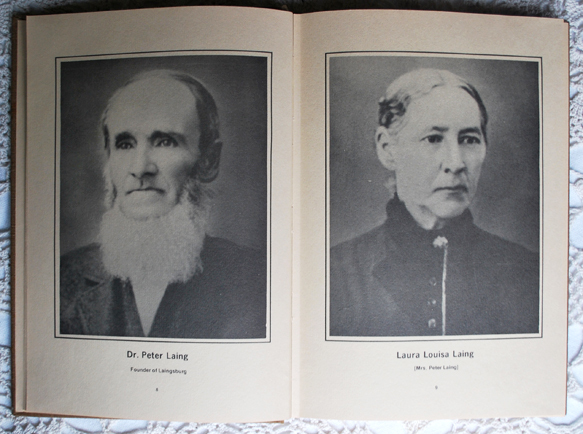 His second wife’s name was Mrs. Laura Louisa Kemp, and together they had two more children; Charles and Paisley. Paisley, of course, is noteworthy because he is the Amos Boys’ great-grandfather. (The name Paisley is interesting in itself. It shows up so many times in the Laing family—even some of the women have it as their middle name.) Also, take note of Peter’s age when he married Laura: 56 years old. And he was 60 when Paisley was born! So, here are a couple sites to put on our tour. Don’t worry, we’ll make up a map with everything clearly marked (really, I’m surprised Mapquest doesn’t specifically mention the Amos name in their online maps). In the meantime, here are three interesting newspaper articles. Jerry has several more, but guess what, you’ve got to come to the reunion to see them! This first article is about Helen Lucretia Phelps. She’s not directly related to us, but I thought its headline deserved attention. Can you imagine the uproar it would cause today? I asked the Amos Boys who might have been “non-white?” Native American Indians. According to Jerry, at one time there was a push to change the town’s name to Sleepy Hollow. This next article covers a bit of that topic. The name change didn’t go through, obviously, but now there is a Sleepy Hollow State Park nearby. Two years ago when I blogged about the Larson side of my family, I featured our stylish Easter fashions. Well, certainly we can’t have the Amos family outdone, so I’m doing the same for us this week. Actually, historical photos prove we Amos’ are a very stylish people (in our own special way). Let’s take a look at this collage of fashionistas, which maybe isn’t in correct chronological order. But that’s okay, because maybe we didn’t always express our great sense of style in the correct chronological era. 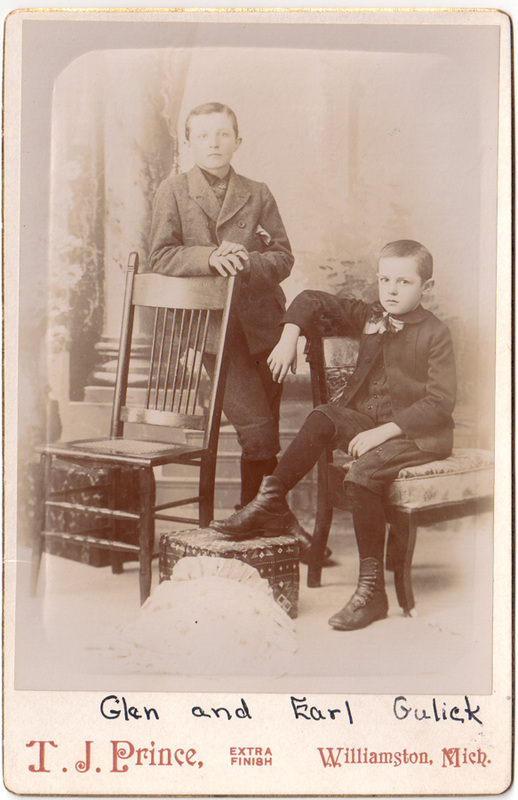 In a past episode of our family tree, there’s a picture of Earl Gulick and his brother Glen. Of all things, poor Earl is stuck wearing a skirt. In this picture he’s grown enough to wear short pants. True, he has leggings underneath and some bow around his neck, but at least he’s now into pants. 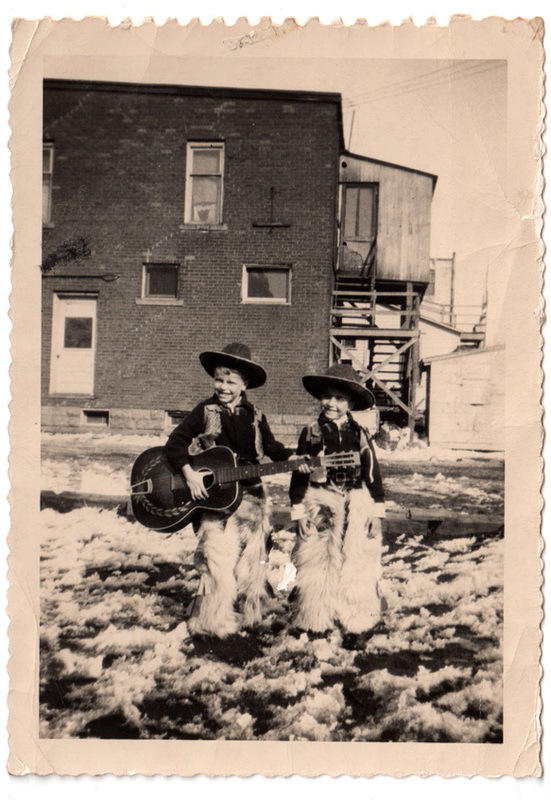 Not only do we have musicians in our family, we have cowboys as well. Here are Duane and Bruce looking mighty pleased. And here are Bruce and Jerry, looking mighty sharp. It’s interesting that even in the hard times of the Depression, it was still important to dress up. 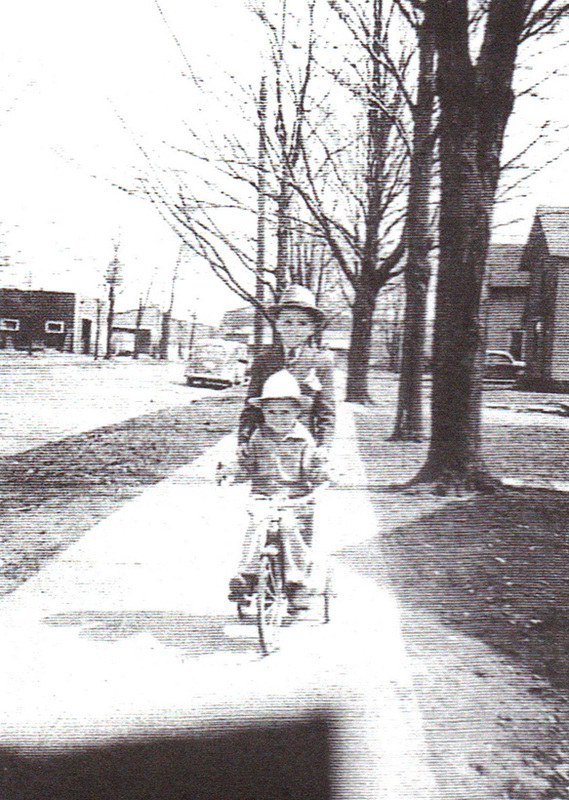 For example, Duane, Bruce and Jerry wore leather shoes, even to school. “We didn’t wear tennis shoes like they do now, except to play basketball,” says Jerry. Times have changed a bit, eh? 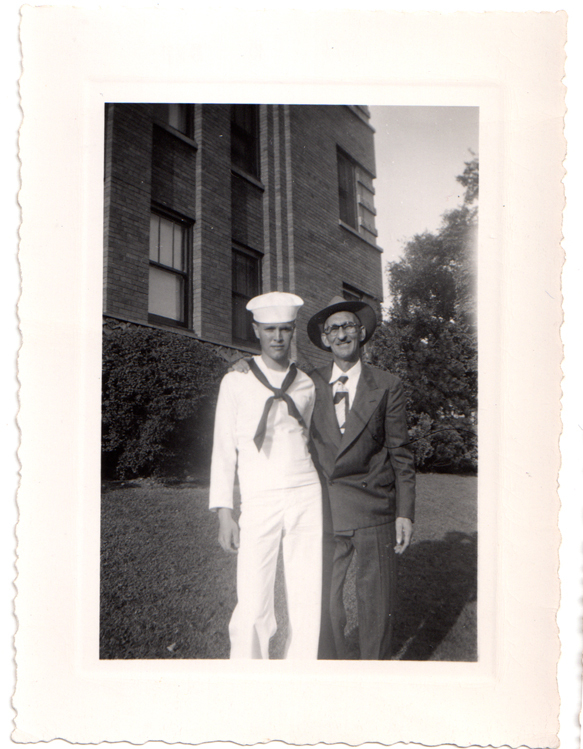 It’s been said the Amos Boys were some saavy dressers as young men. Jerry says it must have been Duane and Bruce, because all he wore were blue jeans and T-shirts. “They tapered from the knee down,” adds Bruce. I wondered what kind of socks they wore with those tight pants. White? Black? Well, the guys weren’t the only ones paying attention to socks. Their women did as well. Jerry’s wife Elaine remembers wearing blue jeans rolled up just below the knee and their socks rolled down. And of course, they wore saddle shoes. 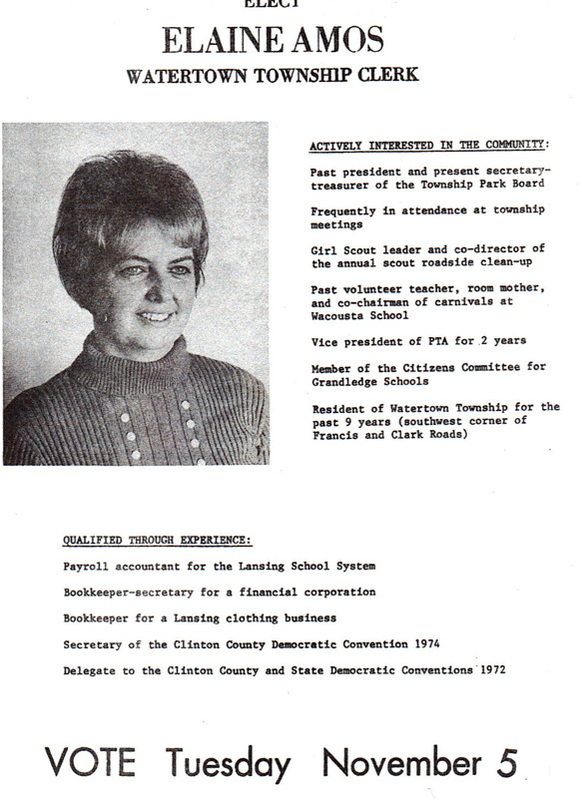 Elaine went from a high school girl rolling her socks down in the 1950s, to foxy mom and politician in the 60-70s. 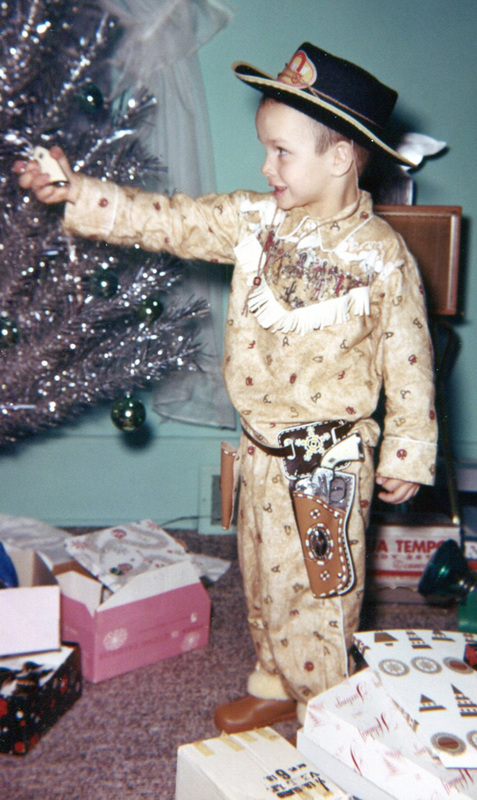 Like I said, we have cowboys in our family. Here it’s 1971 and the young generation is separating their style from their parents’. 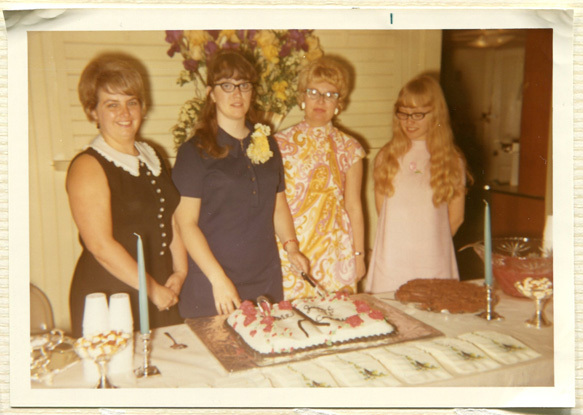 Elaine and Carol still have the big hair, but Vicki and Terri are into long, flowing tresses. And bangs. What about Carol’s paisley print dress? Wouldn’t that be a vintage treasure today? But the eyeglasses—oh, the eyeglasses! Those are what’s funnest of all. Jerri Lynn’s cat-eye glasses are well complimented with her flowery headband, don’t you think? 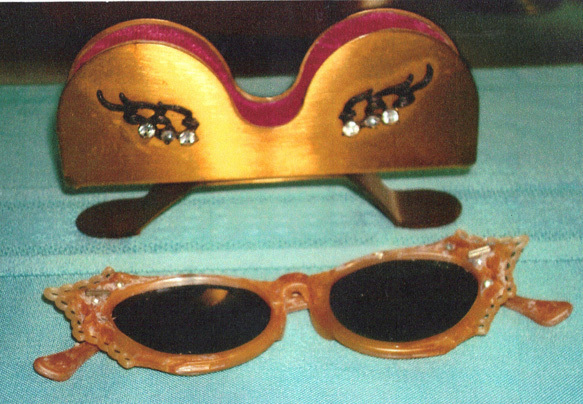 Here are some vintage sunglasses possibly from the 1960s. They’re part of Elaine’s cool collection of eyeglassware (I bet she where’s these when she goes out with the girls:-). Isn’t it amazing what slaves we are to fashion? For 40 years I wondered what the heck I was thinking when I wore those black glasses. Now look, here I am again. 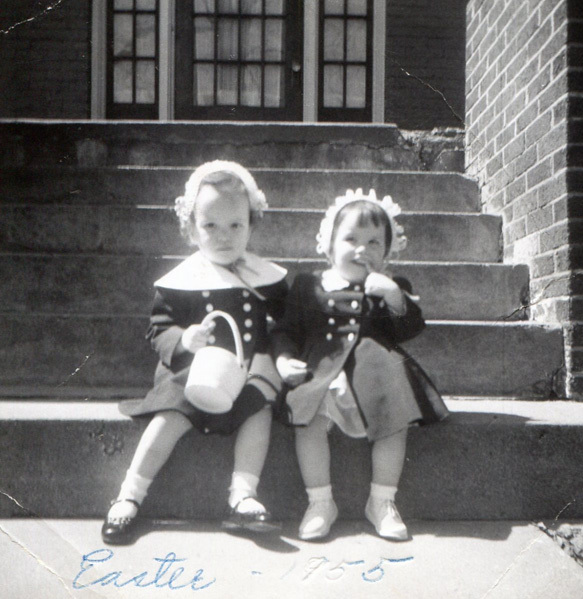 And last, since it’s Easter and we just can’t overlook this beautiful day, here are some Easter bonnet darlings—Vicki and Shelley. Happy Easter everyone! May you have a very blessed day!